"I had to learn to speak again, but there were times I couldn't talk," said the Seattle engineer. "I'd come home, and I was so depressed. Then, I'd see Hollie, and it took a lot of the grief away. She was just a godsend." After he retired from Boeing in 2015, Vande Zande wanted to share his gift. So, he got Hollie certified as a pet therapy dog and went back to the hospital stroke unit to help others. "I brought her in and everybody fell in love with her," Vande Zande said. "She had lost a leg to sarcoma (a type of cancer), but she was so special. I wanted to go talk to people who were going through what I went through. But first Hollie broke the ice." Hollie, who was named a Stroke Hero by the American Stroke Association, died in late 2016 at 13. 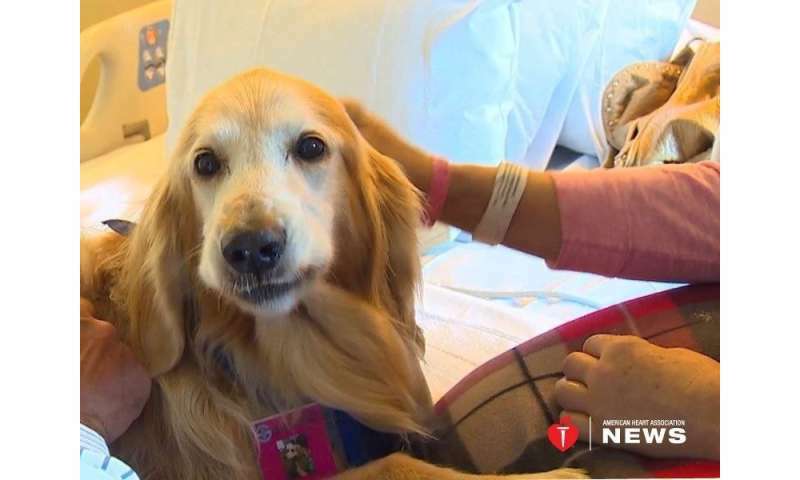 Now Vande Zande takes Katie, another golden retriever, on his rounds at Swedish Medical Center's Cherry Hill campus, where she dispenses unconditional love and collects hugs and belly scratches in return. Like thousands of other pets across the country—mainly dogs, but also cats, rabbits, birds and other animals—Katie is a not-so-secret weapon in helping patients recover, physically and psychologically, from their ailments. "Lots of research shows how much the animal-human bond benefits both of us," said Dr. David Williams, chief medical officer for Pet Partners, which trains volunteers and coordinates animal-assisted therapy in 47 states. "We see it in practice every day." The idea isn't new. Reports of animals comforting humans date back centuries. In 1859, the famed nurse Florence Nightingale wrote, "A small pet animal is often an excellent companion for the sick." Sigmund Freud reported that patients were more willing to talk when his dog Jo-Fi sat in on psychotherapy sessions. Williams said research on animal-assisted therapy began in the 1960s, and has shown benefits ranging from lowering blood pressure, heart rates and pain levels to releasing hormones that ease depression and promote an overall sense of well-being. "A lot has been soft research, looking at causal relationships," said Williams, who is an emergency room physician. "We still need more, true academic-level studies looking at how AAT [animal-assisted therapy] can benefit us at the biochemical level. Those are really just beginning now." Meanwhile, the practice is spreading. The American Kennel Club lists dozens of therapy dog certification groups on its website. Pet Partners, one of the organizations listed, says it has more than 10,000 volunteers and is signing on new institutions all the time. Lovable pets raise spirits in schools, nursing homes, airports and hospices; help autistic children connect to their surroundings; lower stress in college students facing final exams; and help veterans cope with post-traumatic stress disorder. "It's miraculous," said Rabbi Jodie Futornick, staff chaplain at Swedish Medical Center, who sees Katie and other pets in action. "I see people calm visibly when a dog comes in. I've seen people respond verbally and non-verbally when they hadn't been responding before." The impact, she said, isn't just on the patients. "If I'm having a bad day, all I need to see is Scott and Katie walking down the hall," the chaplain said. "She's so sweet and friendly. Nurses and doctors and the whole staff take great delight in being able to pet a dog in the middle of their day." Vande Zande is certain the feeling is mutual. "Every time we go to the hospital she doesn't want to go home," he said. "I have to pull on the leash to get her out the door." Not just any dog can stroll down a hospital corridor. Pet Partners' certification program includes a seminar for the human and an audition for the animal. "The dog has to have the rudimentary ability to sit and stay and follow commands," Williams said. "Once you feel you and your dog are ready, it's a two-hour test. They make sure you have good control of the dog and the dog has a good temperament. They have people act like patients, and the dog can't be startled or scared of the process. It does exclude a lot of dogs." So far, it has excluded Ginger, the loving-but-rambunctious golden retriever Vande Zande hopes will succeed Katie someday. "She's failed twice," he admitted. "We're working on it, but right now she just wants to be a puppy. "But she's a great dog, and I'm still hopeful."